I am excited to kick off the new year tackling the mess in my new home. The hubby and I just got all of our final things out of storage so now we have more boxes to go through. We, did however, take several boxes of stuff we just didn’t need anymore to out local Goodwill. That is not to say we have gotten rid of everything. NOPE! Not even close. Feels good so far. But now it’s off to tackle my craft room. One of the best things in this new home of ours is that I get my very own dedicated craft room. I thoroughly enjoyed creating a ton of projects this past December but it wasn’t easy as I didn’t have a central location where I housed everything. I want to bring even more projects to you all, so I need an organized space that I can work in and be more efficient. Plus, I am dying to get back to sewing and I am looking forward to having a space where I can get away and relieve some stress with fabric and thread. Yes, it’s totally soothing to me, I swear! However, I got nothing started. NOPE. NADA. 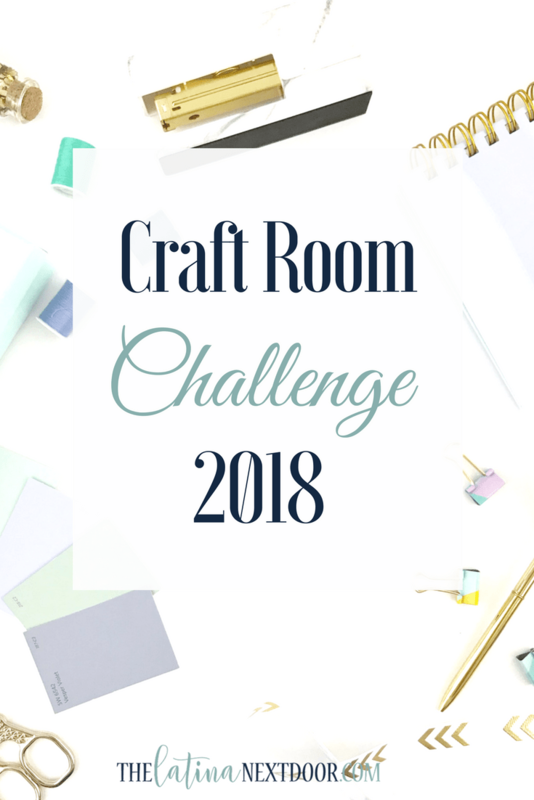 Which is why I am super excited to be joining this Craft Room Challenge hosted by my friends at The Inspiration Vault. I need to get my stuff in order. 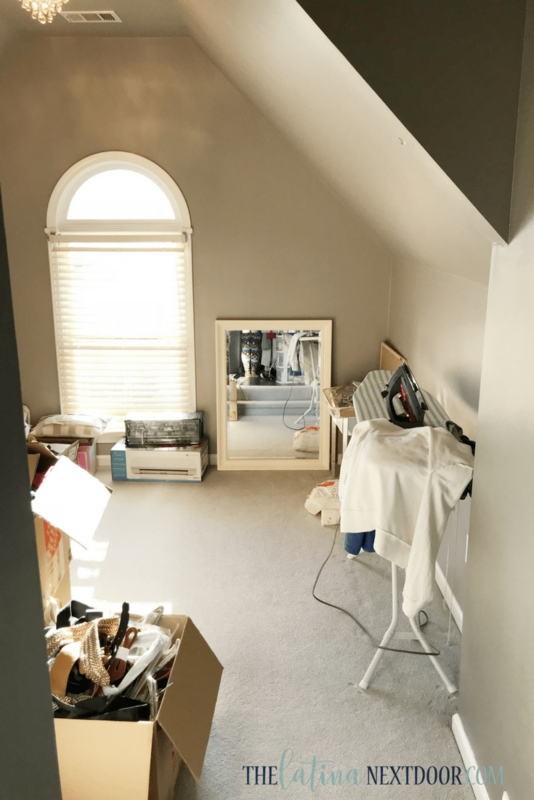 Here is what my space looks like now… the space is actually like a sitting or dressing room off our master bath (weird I know, but it’s all mine!). It doesn’t have a door either… just a step down. I am almost embarrassed to share. There are boxes that don’t belong (from the move… and yes, unopened). And not to mention, there is a dreary color on the walls and none of my furniture matches. 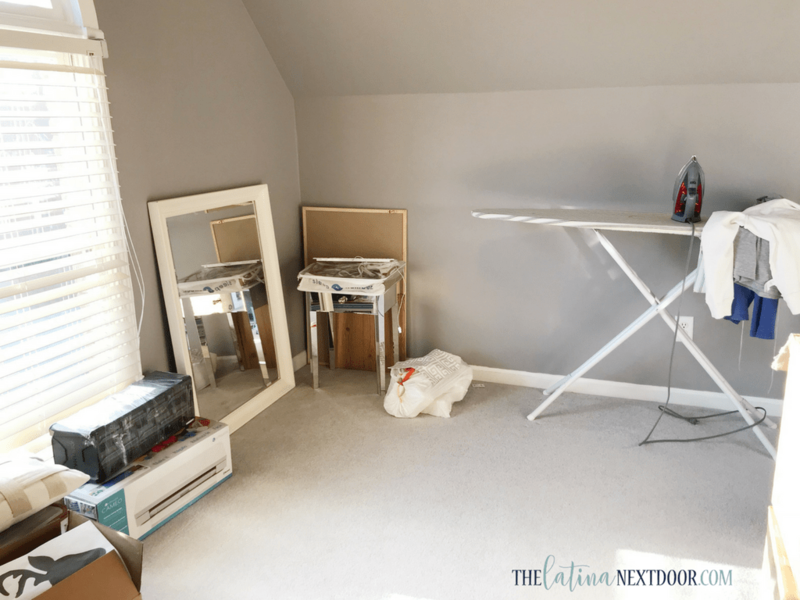 And there’s an ironing board that never gets put away! Gah! Ya’ll have seen spaces in my home before. I just haven’t had the time to get all this set up. I have no systems in place for storing away anything yet and well… it’s just a hot mess. I cannot create in here. It’s just not inspiring. 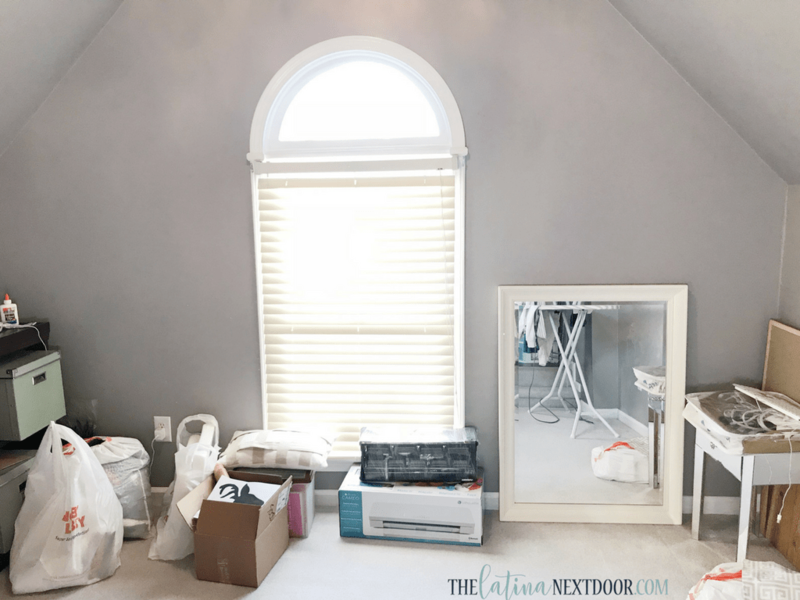 Paint the walls and trim – the paint is dark and not my style. It had been a while since the previous owners painted and areas need to be touched up here and there. New window treatment – the blinds have been burned to a crisp by the sun. It’s time to add something new. Organized shelving – I actually have 2 of those half-sized bookshelves and will be adding both to this space since the other one isn’t really being used at this time. 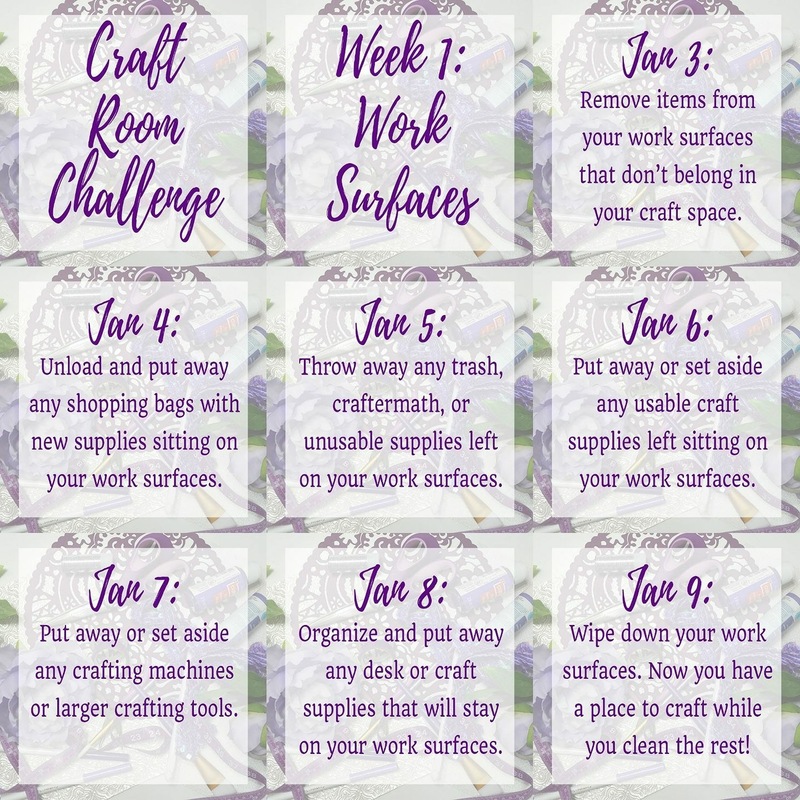 Organization boxes, bins, and systems – My craft area wasn’t working in my last house and clearly isn’t working here so I need to set up new systems and ways to organize that will allow me to easily access things and put them away. Decorate – Obviously I want a space that will inspire creativity so I hope to add a few touches here and there to make it look nicer than just a place to do crafts. I may even change out the light fixture since it’s not really my style and doesn’t give off a ton of light, but if I cannot find a cheap one, I will wait. Well, first and foremost…. as cheaply as possible! I am really trying NOT to spend a lot this year at all! My hubby and I have a financial goal and we want to be able to meet it this year. So I plan on using a few things that I already have on hand to cut costs and then buy things as inexpensively as possible. I will also be getting rid of a few things too. There are just some things for projects I have had FOREVER and I haven’t even used them so I will be chucking them to make space for things that I do use regularly. So because I am starting from scratch, my steps this week will be a little different from the rest of the bloggers who have their rooms already set up. Here are the steps I will be taking this week to get started on the right foot. Bring furniture back and place in desired locations. Purchase a few items and systems that will make the craft organizing more efficient. Wish me luck! And don’t forget to check out our cute little trailer featuring some of the other spaces for the challenge below!